Happy Mask Monday! Today I have an adorable mask to introduce to you guys and that is the SNP Character Face Rabbit Whitening Face Art Mask. Whew, what a long name. I got these a while ago and promised that I would review them, so here is it. 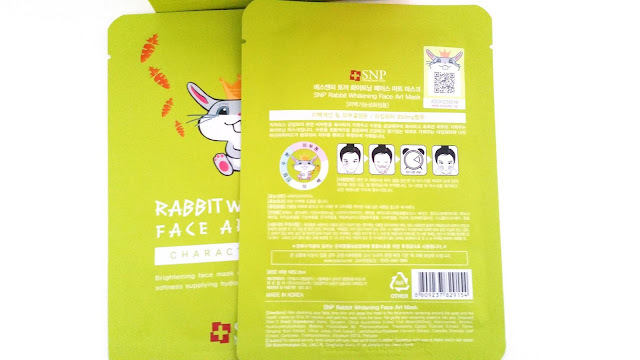 The Character Face Art mask line have 3 kinds of masks and I purchased all 3. So I will be reviewing the Cat Wrinkle and Squirrel Aqua very soon. I was drawn to these masks due to their adorable design. 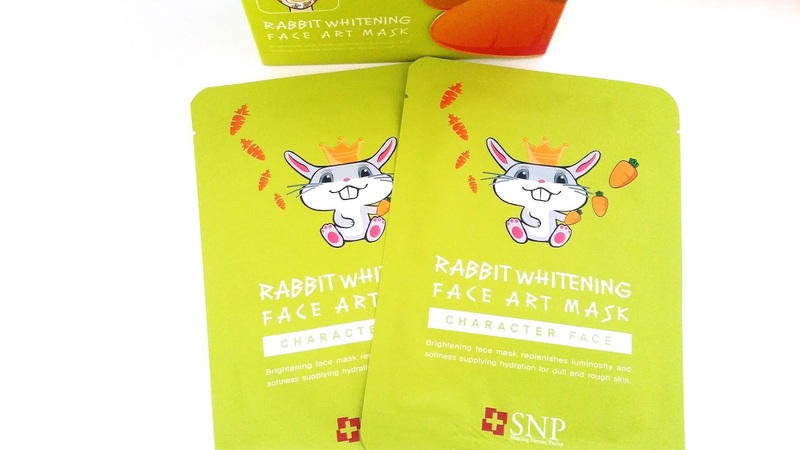 SNP masks are known for their unique cartoon animal designs. 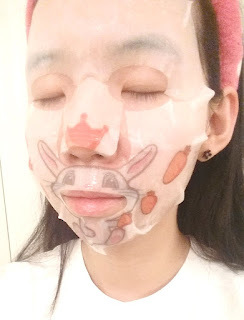 It makes skincare time fun and entertaining. I've always liked face art, so, it's no surprise that I gravitated towards these masks that claims to create a face art like look. I purchased them with the hope that they'd work as beautifully as they look. 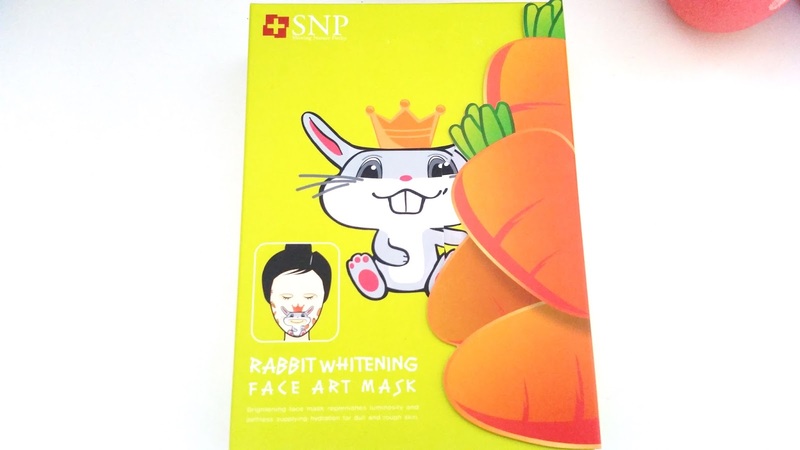 Product Description: An adorable mask that can help to brighten and nourish the skin. The mask is formulated with 850mg of lime water, soybean ferment extract, and ginseng root extract to help diminish wrinkles and nourish the skin. It can lessen the formation of melanin and help brighten uneven skin tone. The mask is free of paraben, artificial pigment, mineral oil, and synthetic silicon. To Use: Cleanse and tone the skin first. Apply the mask and leave it on for 10 to 15 minutes. Remove and pat in remaining essences. Ingredients: Water, glycerin, citrus aurantifolia (lime) fruit water (850mg), Niacinmaide, alcohol, hydroxyethylcellulose, betaine, polysorbate 80, phenoxyethanol, theobroma cacao (cocoa) extract, panax ginseng root extract, citrus junos fruit extract, lactobacillus/soybean ferment extract, camellia sinensis leaf extract, carbomer, triethanolamine, Disodium EDTA, perfume. Please Do Not use if: you are sensitive to alcohol or any other ingredients in this product. Packaging: Adorable packaging all the way! The front of the mask shows the face art design and the back of the mask has all the important information. I liked that it came with an English ingredient list too. 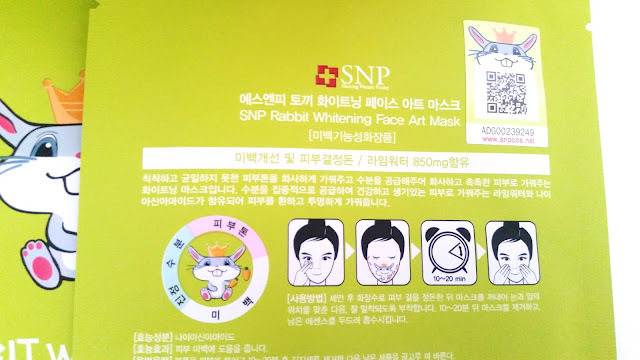 It also has an authenticity sticker and I'll share how to check the mask's validity in the picture below. Scent: Not my favorite part of the mask. It's got a very strong scent. It's listed in the ingredient list that perfume was added to this mask. The scent is strong, fresh, and a mix of citrus and herby-plant scent. Not medicinal herb like but more mountain fresh plants like scent. It would have been more pleasant if it wasn't super strong. 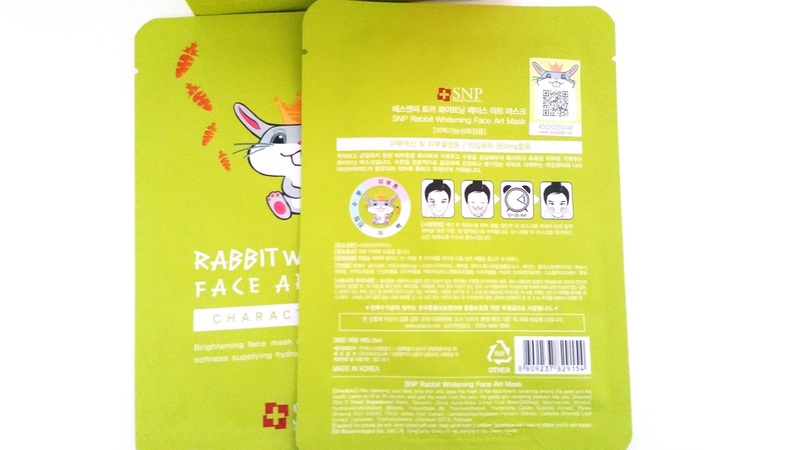 Color: The essence is clear in color and the sheet mask is majorily white with the rabbit and carrot face art designs on it. Texture: The mask sheet is very tough. 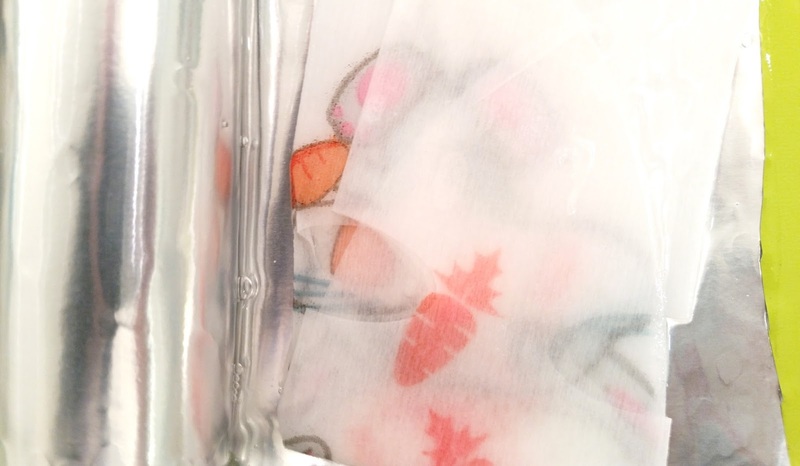 Not tearable and scissors must be used to cut and adjust the mask. I haven't experienced such a tough feeling sheet before and I'm not quite sure what I can compare it to. Not a big fan of it because as the mask dries, the sheet starts to feel super tight on the skin. The serum is liquidy but also a bit sticky. It takes quite sometime for it to be absorbed into the skin. How to verify your SNP mask's authenticity. I thought this was neat, like the MBD masks, SNP has come out with a way to verify their mask's authenticity. 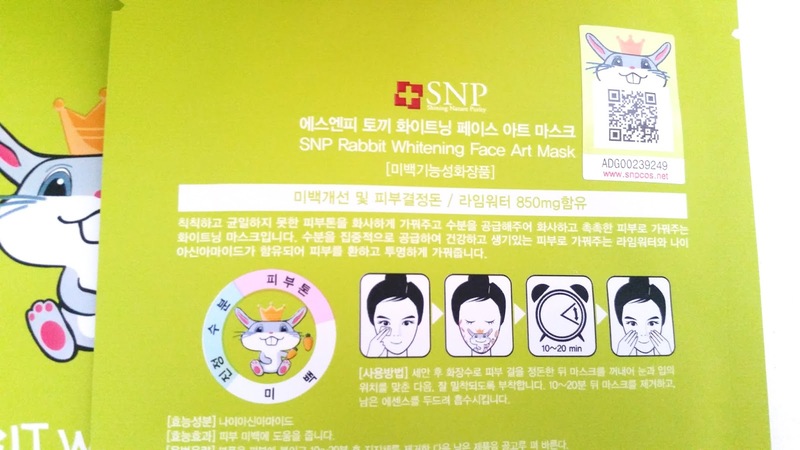 However, unlike MBD, which only have codes on the boxes, SNP have an authenticity sticker on each of the masks. It will be on the back, top right corner. It'll have a QR code, a string of numbers and the SNP website. Simply go to the website www.snpcos.net and you'll find that the right side of the page has a red button, click it. Upon clicking it, a pop-up page will appear. The page will say Original Product Certification. After it, it'll have a section that asks you to input your serial number, which is that string of numbers on the sticker. (As you can see in the image above, my mask's serial number is ADG00239249.) After you enter the number, click the dark gray button next to it. 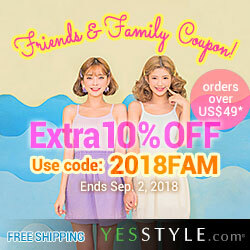 If your number is valid, the page will say "Valid! Confirmed the original SNP product", like in the image above. 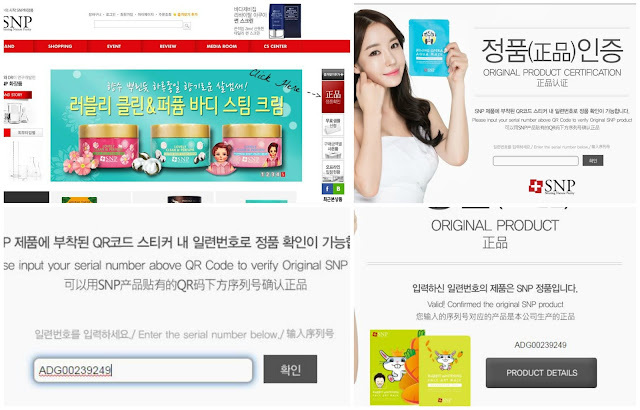 If the number you entered if not valid, a mini pop-up will occur saying the follow "라벨 번호가 잘못되었습니다." which means the label number is invalid. My Thoughts: I have mixed feelings about this mask. I really like it but there are little things here and there that makes me feel otherwise. I have to admit, it is an adorable mask. 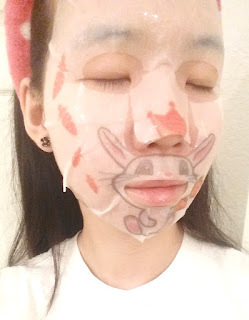 The face art design is pretty cute and it does look nice. The mask did a great job moisturizing and brightening my skin. Even if the effect is temporary, it lasted me just a little over a day. Not too bad, I'd say. I didn't noticed much wrinkle (fine lines) care, but my face did feel soft and supple after using it. My biggest dislike is the strong scent. It's not a super unpleasant scent, but it was so overwhelmingly strong that it made it unpleasant. The slightly sticky essence can be an issue for some. I just gave it more time to absorb. Once absorbed, it didn't leave a sticky feeling on my face. The tough sheet was an odd thing. I had started to adjust the fit with my scissors, but stopped after the nose part because if I cut it the design would be messed up. I wish the sheet was more stretchable, so the design could still be intact, while we adjust the mask to fit our face better. Final Thoughts: Despite the little draw backs here and there, I'd say this mask is still pretty darn good. I was afraid that masks with amazingly adorable designs wouldn't have amazing effects. However, I'm glad I gave this a try because it's not only cute but has some nice skincare benefits. Would I repurchase this in the future? Hmm, still debatable. The realm of masks is big and I want to explore it all. I might come back to this mask if I don't find other cutely designed masks with better benefits/results. Do I think this mask is worth a try? Sure, why not? It's definitely cute and perfect for skincare entertainment. If you are sensitive to strong fragrance, I'd say give this a skip. Otherwise, go for it, you might just find a new mask to love.